The latest breakout style in men's apparel is a trip back to the future. For awhile, men were cutting ties with the necktie, and it slipped out of vogue. But now, reports Seth Doane, it's hip to be retro. Younger men, in particular, are taking to the growing trend, Doane says. He observes that, while many politicians are going sans tie in an attempt to appeal to a younger audience, young men have been putting them back on. Ties are almost a cover-page uniform on magazine covers this week; they're on TV; and they're on the likes of J-T -- Justin Timberlake, among other celebs. Says GQ Style Editor Adam Rapoport: "It's about attitude, it's about style, it's about flair. It's not about looking button-down." Tie-clad celebrities adorn GQ's cover. "I think you're seeing a lot of younger guys wearing ties now, but they're not business ties," Rappaport notes. Tie fan Benjamin Moore could wear a t-shirt and jeans to work, but he often chooses to put on a tie. Moore says he saw a man recently wearing a tie -- and hoodie! Grabbing a cappuccino before work, Moore said it's cues from celebrities that push these trends, and having the option of wearing or not wearing a tie makes wearing one more appealing: "I think companies are becoming more relaxed in what they're allowing people to wear. Before, a tie was a requirement, and now, it's like an option for people." According to groups that keep track of this sort of thing, while tie sales are down among older populations, they're up among 18 to 34 year olds -- by more than 13 percent in just a year. "We're seeing a lot of younger customers coming into our store," observes Robert Dundon, president of Thomas Pink USA. It's been in the tie business more than two decades. Now, Thomas Pink is seeing an up-tick in customers interested in ties for weekend wear. 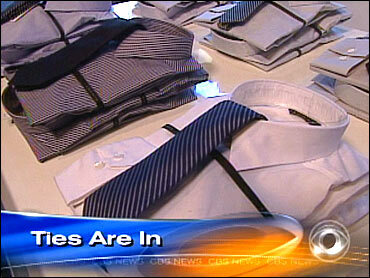 Dundon says ties appeal to young men again because there's "been a backlash to the whole casual dress thing. I think that's part of it. I think also, it's about -- you can be dressed up and still be cool." GQ's Rappaport says, " ' Casual Fridays' are so schlumpy, it's guys in bad khakis and even worse dress shirts, kinda tucked and unbuttoned one button, like, 'Ooh, I'm getting crazy! ' "
The designer sportswear brand Theory didn't even sell ties two years ago. Now, it's branched out to include neckwear after seeing a demand in the marketplace. But this isn't your father's tie. "Wearing it with a ripped pair of jeans or a cool cardigan or a cool tight skinny jacket," says Theory President Chris Manley, "it's the way to hip it up and make it look modern."